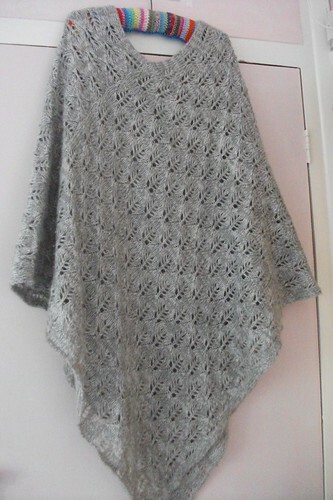 This week I have been crochet mad! This is my new favourite cup. Would you like to join me for coffee and a cupcake? Only joking, how about one of these? I have done a spot of thrifting. I'm very happy to have found these. My Mum used to have them in her cupboards. It's amazing how a pattern can bring back memories. I just like seeing them on my shelves, and I think I might start a little collection. I have been dipping into this basket a lot lately. and found myself making something very bright and colourful, more than normal! I have been in my craft room using my sewing machine, Miss.Trissie. She used to belong to my grandma. She is working really well, considering she must be almost a hundred years old! I have been finishing lots of cushions and this really feels good. I have enjoyed draping cushions around the house and taking lots of pictures. I love this cushion, for me it represents everything I want my little red suitcase shop to be about, colourful, retro, fun and modern.......! It's ready to travel and I just might be able to let it go! .....Home is tidy, my teen had a week off ill, so no school wrangles. I have been managing to clear some of my forever piles. You know the ones, hand washing, mending, tidying the clutter in my craft room, again! There are still some I would like to get to, but I need to do more clearing first, but I do feel as though my word for the year CLEAR, is having an effect. It's been good to craft and finish things. I have given my etsy shop a little tidy and update. I have been doing some homework to do with postage and packaging and dreaming off making some new labels and postcards. So perhaps the spring energy is beginning to move and now I will be spending the next few days catching up with you all. Your cushion is lovely, I'm sure it will be snapped up very quickly! 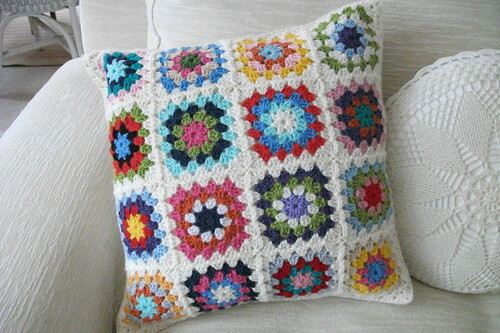 Is the brightly coloured one going to be a cushion too? 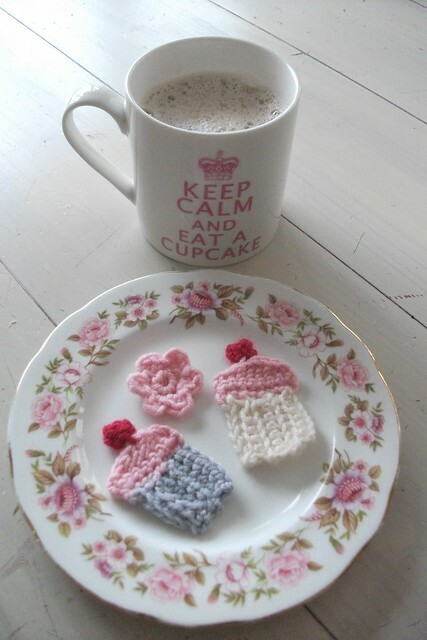 Your crochet cupcakes are very pretty (almost good enough to eat!!!) 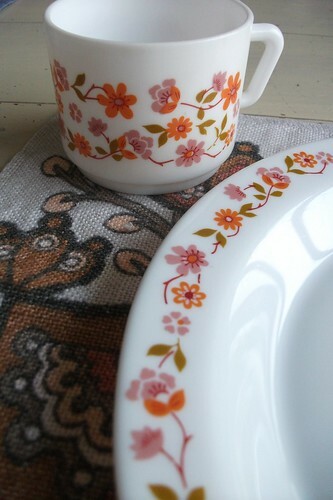 and on a very pretty plate too! You are feeling better, I can see it !!!!! So glad for you!!! I'm happy that your shop is how you want it to be!!! Yay!!! Hi Heather, Wow what a busy girl you've been!!! Love your cushions!! You have an amazing eye for color, something I always struggle with! Do you follow a pattern or do you just do your thing??!! Thank you for all your comments and always finding the time to stop by!!!!!! Your crochet work is looking good - as always:) I am working on a *rainbow* blanket (it's an UFO), and I hope to get it finished this spring. 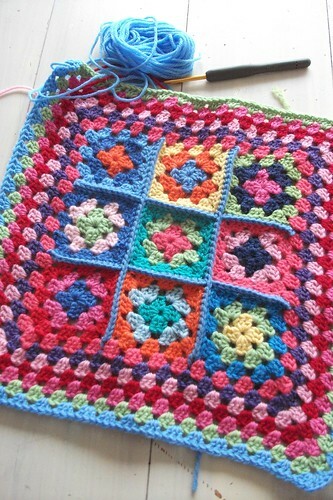 Hello Heather thank you for telling me about the crochet book, i have ordered it, it cost me 1p!! 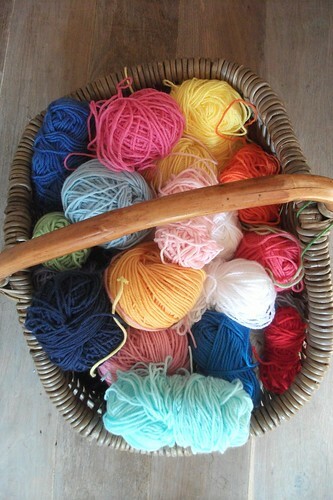 Love that happy basket filled with colorful wool! I absolutely love that cushion, it really is gorgeous. It will brighten up any corner. 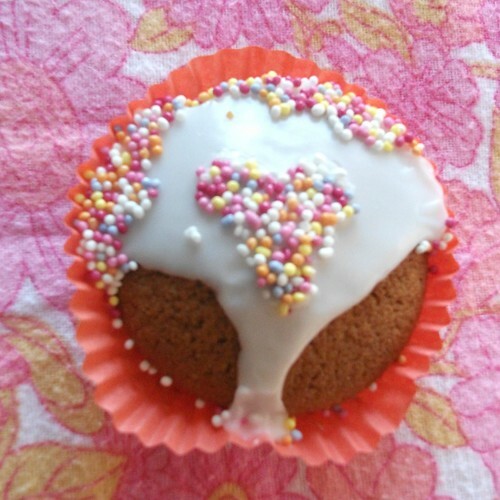 Love your cupcakes of the eating and non-eating kind : -) and lovely cushion/s!! Good to hear you're tackling the *must do* things ... that will be me one day too!!! What happy colors you've got in this post! You've brightened my day. Reading your little blog, Heather, always feels like I've had a bit of a visit with you. I especially like the white bordered pillow. the white gives the eye a place to rest between the busy squares. Also, lets the colours pop! 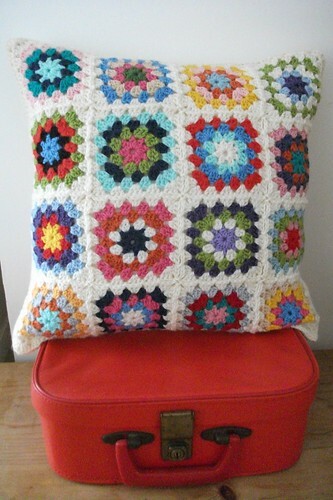 Loving the cushions :) And the poncho ... it would be easy to make one you know. Lovely cushions and cupcakes. But your yarn basket just caught my eye !!! What yarns are you using ?? I'm new here, your latest follower.